Cordylines take a battering again! Still, the shot is great. Had much snow your way? Oh I do hope it comes thru the winter..but great pic. Graet picture, itis the same in my garden this mornig been out knocking the snow off Conifers and vunerable shrubs, if you dont theres a danger the branches and leaves will break, hope yours survives! 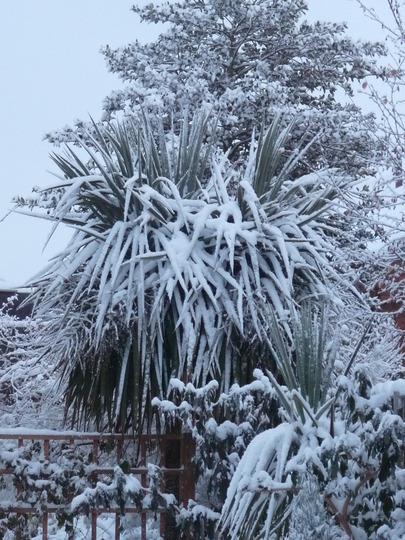 Thanks for the comments everyone.....luckily the tall Cordyline was snow free today, but since then its snowed again. Been putting some tubs away that I'd left out, not sure about the Fuchsias....will have to wait till spring to see if they're okay. Oh dear....it's here we go again, I am sure as they survived last winter they will cope with this one? it is a great shot Janey. one of mine had just stated to regrow and now it covered again urgggg go away white stuf !!!! We can't win Cristina, those sunny borders with Rudbeckias flowering are now frozen underneath this deep mass of snow. Its like the wicked witch of the north has laughed her frozen breath over England. I heard there was a cold spell...there is snow even in Holland, where they usually don't see any in December. Fancy seeing this again Dd, now I need to turn the heating up! No , they died right down to the soil level, the stem turning to pulp. This year though, they have shot up from the base, the leaves being about 3ft tall now. It'll take quite a few years to create the stems that's if the winters aren't as harsh. -20 how dreadful. that is very cold, I cannot believe you lost your Eucalyptus as well, I would be heart broken........ so have you stopped putting in half hardy plants now? Yes, I was at the time Dd...they were the main structure in the garden and were here when we bought the cottage. Yes I have really, I stick with what I have now, but grow annuals for summer, and as you know I love grasses and sedges. Right at the back of the garden is a Robinia, bought as a Frisia like yours but its just the usual one. In a couple of weeks I'm having it cut down as it's far too large for the space we have. See who else is growing Cordyline australis (New Zealand cabbage palm). See who else has plants in genus Cordyline.